When the Nest Cam IQ debuted last year, people were absolutely blown away by the camera’s impressive new facial recognition features. In fact, many people were so blown away that they were willing to spend a whopping $300 just to buy one Nest Cam IQ. 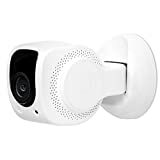 If you want a home security camera that offers similar features but doesn’t cost an arm and a leg, definitely check out the Tend Insights Lynx Indoor 1080P Wifi Home Security Camera. It has a very cool intelligent facial recognition feature that helps the camera learn who lives in your home so it can notify you when unknown people are present. It’s also on sale on Amazon right now for just $47.49, which is obviously a heck of a lot more affordable than $300.